The objective of this php wishlist script is to save any items to your wish list from anywhere on the web. Almost every store on the web has a wish list these days. But it only works on their own site. But in this project you can store all your favorite items from any website on one site. You can run your own wishlist website. You can install this script to your OWN server and run your own wishlist system. The server requirements are just the latest php and mysql. Administrator can manage the members who have registered to this website. He/She can change the status of the user by activate/inactivate them. The admin can also manage the categories,items and the gift articles displayed in the website. The admin can also add/edit/delete the occasions and set the recipients for each occasions. He/She can set the Frequently asked Questions and Answers (FAQ). He/She can add email templates which are used to send mail to the friends about the user's wish list. The administrator can also edit the static html pages like Site map, Getting Started etc. 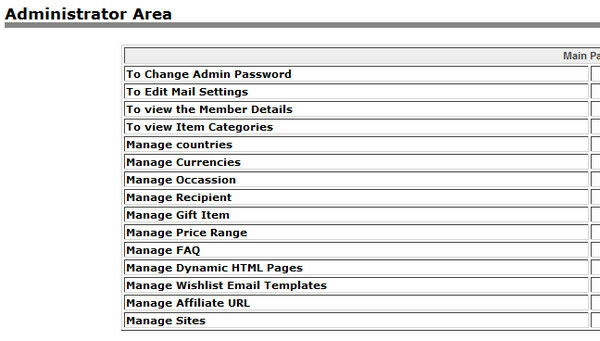 The admin can also set the site names and affiliate urls for each site. The users are allowed to add items only from the site names added by the admin. The items added in the public list can be viewed by all the users. Only the registered users can access the items added in the private list. The Friends List items can be viewed by all exactly like public pages. The users can add/edit/delete friends to 'My Friends' list. They can also search for the friend and view the friends wish list. Then they can buy the items for their friends. When the users buy any item, they can enter their details in the item form. SO that the friends can know who has bought the item for them. When the users buy the item from any website, then its affiliate url will be run as a background process. The affiliate url with respective affiliate ids for the websites are set by the admin. If the items are purchased already, then it will be displayed as 'Already purchased'. SO that two users won't buy the same gift item for an user. The users can click on the link and view who has purchased the item. The users can also search the gift details based on the occasions , recipients and the price range and view the gift items.